Monrovia, Liberia: The President of the Republic, H.E. Dr. George Manneh Weah, Thursday, January 17, 2019, toured the Executive Mansion and inspected ongoing works taking place at this official home of Liberia’s Presidency. The Liberian leader expressed delight over the speed and quality of the works being done. The Executive Mansion, which was constructed between 1960 to 1963 and dedicated January 3, 1964, was gutted by fire in July 2006 and has since remained unoccupied by the Presidency. Since the incumbency of President George Manneh Weah, the Liberian State House has been picking up appreciable form owing to the accelerating renovation works taking place there. President Weah, apparently anxious to return the Executive Mansion to its original splendor as the official seat of Liberia’s Chief Executive, took some time on Thursday to familiarize himself with the pace and quality of ongoing works. In a chat with Liberian engineering consultants and officials of the Italian construction firm, SESAF, which is in charge of the renovation, President Weah said he was pleased with the works being done and lauded the contractors for their hard work and speed. The President also toured other ongoing projects in and around Monrovia. He visited Bali Island, a portion of which he plans to turn into a mega city to be called the Mahatma Gandhi Convention Center. Swarms of Battery Factory Community residents elatedly greeted the President upon his arrival there, singing and dancing in demonstration of their appreciation and support for President Weah’s vision to construct paved roads the country, particularly the one expected to run through their community from the Bali Island flank. President Weah said the construction of Bali Island remains a strong dream to achieve during his administration. He expressed appreciation to residents of that community for willingly and voluntarily carrying the demolition of their structures so as to help create avenue for the construction of the road leading to Bali Island. President Weah climaxed the Thursday tours at the newly constructed Central Medicine Store (CMS), formerly National Drug Service (NDS) located in the Township of Caldwell, Montserrado County. 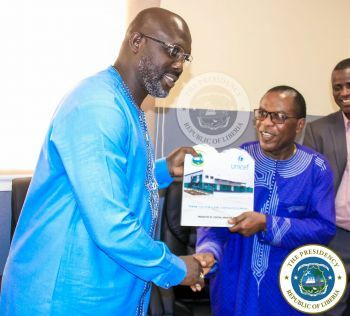 In a remark at the official dedication of the newly constructed Central Medicine Store, President Weah called on authority at the Ministry of Health, CMS authority and other health sector partners to ensure that the needed medicines are placed at the Central Medicine Store (CMS) to meet the health needs of the country. President Weah, who expressed appreciation to Liberia’s health sector partners, emphasized his government’s commitment to improving the sector. He averred that his government would work with relevant local and international stakeholders to ensure a better health delivery system throughout the country.